Thanksgiving is a day for us to give thanks, enjoy time with our family and friends, have great meals and cheer for our favorite football teams. It has also become a day to plan for your “Black Friday” and “Cyber Monday” and other holiday purchases. Black Friday is the “official” kick-off to the Christmas shopping season, even though some retailers are moving their opening hours to Thanksgiving evening. On average over 135 Million people go shopping on Black Friday spending billions of dollars. 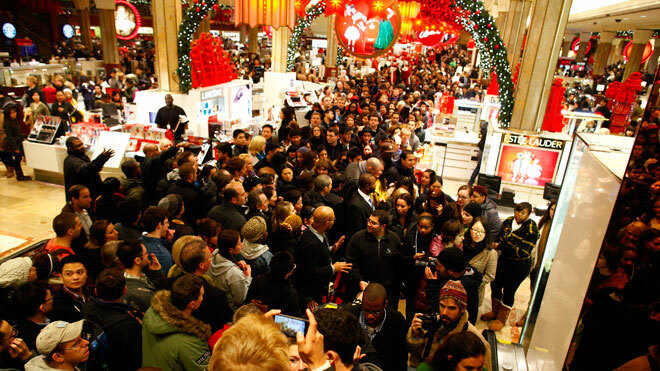 For many retailers, Black Friday is their busiest shopping day of the year! This year, the holiday shopping season is shorter at only four weeks! The term “Black Friday” was first uttered by a Philadelphia policeman in 1966 to describe the large amount of shoppers that crowded the Philadelphia city center on the day after Thanksgiving. The name wasn’t widely adopted into the mainstream and the media until the 1980’s. At that time, economists helped put a spotlight on the term when they said that retail stores go “in the black” with their profits on the day after Thanksgiving. Today, “Black Friday” is seen as a day to get incredible bargains on electronics, toys and even clothing. Most retailers have already released their list of sale items, so shoppers can prepare their shopping strategies. There are some shoppers that started to camp out in front of Best Buy and other large retailers last week, so they could be the first in line! For shoppers who would much rather skip the crowds and shop online, there is “Cyber Monday”, which is one of the busiest online shopping days of the year. Retailers have also set specific deals for online shoppers on that day, including free shipping. What does “Black Friday” or “Cyber Monday” have to do with self storage? Renting a self storage unit is a great solution for storing (or actually hiding gifts from snooping family members) your “Black Friday” purchases. Storage World offers month-to-month rental, which is perfect for storing your holiday purchases. A self storage unit is also a great place to store holiday decorations such as Christmas trees, lights, decorations and wreaths. Utilizing self storage for holiday decorations will help eliminate clutter after the holiday season is over. Storage World’s offices will be closed for Thanksgiving starting Wednesday, November 27th at 1pm, but you will still be able to access your storage unit via gate-access Wednesday and on the holiday. The offices will re-open on Friday, November 29th at our normal hours just in time to you to store you great “Black Friday” finds! Storage World wishes everyone a wonderful Thanksgiving!